April 26 - The London 2012 Olympic Torch, which will be carried over 8,000 miles around the UK over the course of its 70-day Torch Relay, has been recognised as the Design of the Year at an awards ceremony hosted by the Design Museum. The Torch, which was designed by studio Barber Osgerby, was chosen from 89 entries to claim the winning title. Made of aluminium, it is perforated with 8,000 circular holes to represent the 8,000 Torchbearer but they also help reduce the weight of the Torch and prevent heat conduction. "The Torch is one of the most recognisable symbols of the Olympic Games and we are thrilled that our design has won this prestigious title," London 2012 chairman Sebastian Coe said. "I am delighted we have such a brilliantly designed, engineered and crafted Torch that will help to celebrate the amazing personal achievements of each of our 8,000 Torchbearers and give them their moment to shine." Deyan Sudjic, director of the Design Museum, praised the winning entry. "Nothing is harder to get right than designing for the Olympics," Sudjic said. "The lightness and simplicity of Barber Osgerby's London 2012 Olympic Torch does just that. "The Torch not only captures the spirit of London as Olympic Host City but also demonstrates how design can celebrate traditional ideas in a modern way." The award comes in a week where London 2012 showcased the manufacturing techniques involved in creating the 8,000 London 2012 Olympic Torches. 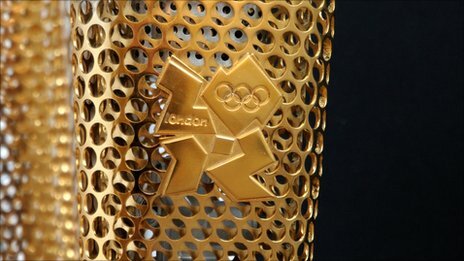 The 8,000 Torches, manufactured by The Premier Group in Coventry in the West Midlands, will be carried through over 1,000 communities in the Olympic Torch Relay presented by Coca-Cola, Lloyds TSB and Samsung. 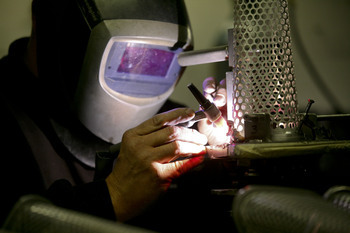 The skilled staff at The Premier Group employ several techniques to create, assemble and finish the triangular form. 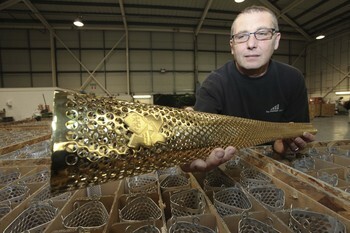 These include laser cutting of aluminium sheets to create the four key pieces that make up the main body of the Torch. The laser, originally developed for use in aero engine turbines, creates very small and precise circular holes in a variety of orientations and facilitates alteration of the circle geometry during the cutting process, allowing the size of the circles to be cut progressively smaller toward the tapered end of the Torch. The pressed material is then welded with a clean, smooth join and the end caps fitted to create the apparently seamless form of the Torch. The emblem of the London 2012 Olympic Torch Relay is affixed to the front of the Torch before it is finally coated with its special gold-coloured finish. The prize for the Torch design marked a double boost for London 2012 at the awards ceremony as the Velodrome on the Olympic Park also won the Architecture Award after being considered the most sustainable and iconic venue in the list of entries. "It is also fantastic news that the stunning architecture of the London 2012 Velodrome has won an award and welcome recognition of the landmark new buildings the Games are bringing to London," Coe added.